Habañero peppers make food delicious, but they make talking pretty difficult. YouTube channel Hot Pepper Gaming demonstrates this regularly but got to do so in style at E3 this year. The channel brought in guest host Anthony Carboni to interview Rami Ismail, business and creative director at Vlambeer. What no one expected was Shuhei Yoshida, president of Sony Computer Entertainment's Worldwide Studios, to not only sit down, but to join in the fun. 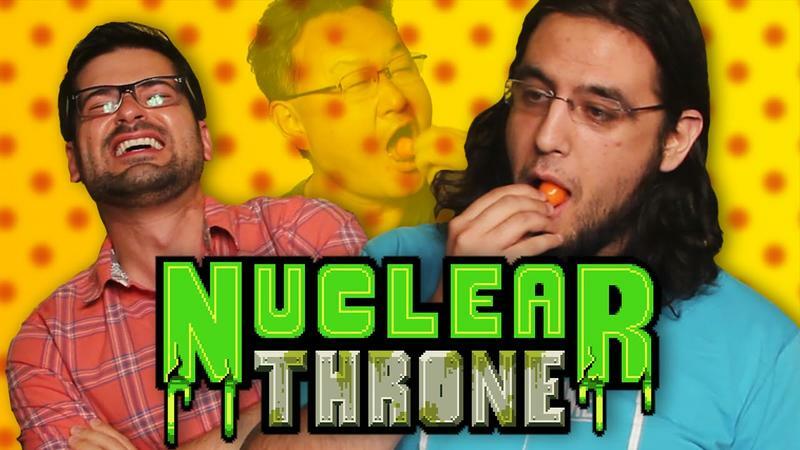 The video above starts with Ismail and Carboni discussing Nuclear Throne, it's place in Steam Early Access, and a quick overview of the game. And lots of distressed, pepper-related coughing. Then Yoshida drops in and grabs a pepper for himself. It's a valiant effort, but his admirable skill with English is ultimately brought to its knees as the heat takes over. Carboni pushes the two for a release date, to which Yoshida replies, singing through the pain, "September! Cannot wait!" All three consoles are lucky to have well-liked faces in front of their consoles, but Yoshida consistently shows that he's up for all sorts of fun with stuff like this. Nuclear Throne is on Steam Early Access now and heading to Sony platforms, most likely, in September. Cannot wait.